Where they're going: half in a bag in the woodshop, half in a box in the basement. While a true experiment would involve a box and bag in both places, I don't have the critical mass of potatoes to maintain proper moisture. I need at least 10 lbs per container, preferably more. 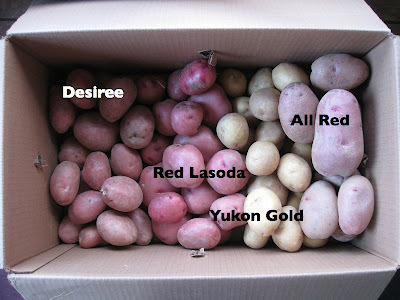 "most of us don't have two or three areas for storing different kinds of potatoes. We are happy enough to have one adequate storage area, and the eating and seed potatoes are placed in the same area...Nate and I store paper grocery bags of potatoes in our garage. It's an attached, unheated garage, an excellent and traditional place for good-enough storage of potatoes in many climes. The warmth from the house keeps anything in the garage from freezing. The garage isn't very airtight, so the humidity is usually relatively high and the garage sufficiently ventilated. We tuck the potatoes away in paper grocery bags with the tops rolled down, and without holes. (Paper bags breathe to some extent.) There is some light in the garage even when the garage door isn't rolled open. And it sometimes is. If the paper bags were left open, the potatoes would green up and develop glycoalkaloids. They would also dry out. A large paper grocery bag will hold about 10-15 pounds and still leave room enough to roll down the bag's top This amount per bag also seems to result in an optimal moisture level under our conditions. When we put 15-20 pounds in each bag, the bags seem to be a bit soggy, and potatoes sprout earlier and more vigorously. We have also used cardboard boxes (without holes in them) to store potatoes, but the cardboard itself becomes visibly soggy, and the potatoes sprout earlier and tend to mold and rot. Boxes might be preferable under drier storage conditions. If you use cardboard boxes, be aware that, if there are any opening and there is light in the storage area, the potatoes around the openings will green up and develop glycoalkaloids. I keep a maximum-minimum thermometer-hygrometer in the potato-storage area. In fall when the area tends to be at a higher temperature than is optimal for potatoes, I open the garage door early in the morning to cool the garage. I also open it occasionally whenever the relative humidity in the garage is getting a bit too low and it's raining outside. Given this approach, we can keep some varieties of potatoes in prime eating condition through April, and can keep seed potatoes through June (though they sprout, of course). Without much attention the garage mostly stays between 45 F and 55 F, and between 90 and 98 percent relative humidity. And a great list of all potato varieties at WSU.